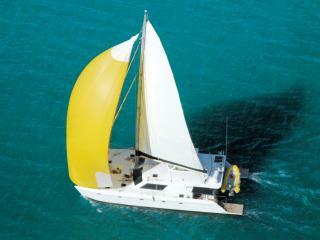 Spend two days and two nights swimming, snorkelling and sailing aboard the the Adventurer, a 12 metre catamaran. Navigate the crystal clear waters of the Great Barrier Reef and cruise to stunning destinations like Whitehaven Beach in style with plenty of time to enjoy the colourful coral reefs. German designed and Italian built Boomerang and British Defender maxi yachts feature a sloop design and 110ft of mast on these two day, two night adventures. At 83ft long and 20ft wide, these high tech vessels are virtually identical and offer a spacious, open plan design for maximum comfort as you cruise. Built in South Africa, Broomstick won the Cape Town to Rio Yacht Race and now spends her life offering speed, style and comfort to her passengers throughout the Whitsundays. Enjoy an unforgettable adventure aboard this maxi sailing the Whitsunday Islands and world famous Great Barrier Reef Marine Park. Arguably one of the most celebrated yachts in history, the Condor has won every major ocean race across the world twice. Not the only unique thing about this maxi, the Condor is also one of the only vessels to visit the Outer Great Barrier Reef (weather permitting) as part of her two day two night cruise. 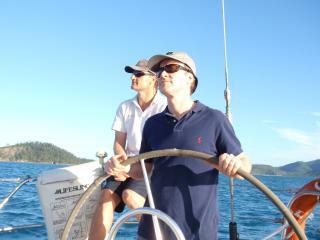 Experience the iconic Whitsunday Islands aboard Australian yachting legend Hammer. This 22.5 metre maxi has placed in the famous Sydney to Hobart yacht race five times consecutively and is ideal for a brief introduction to the thrill of sailing the gorgeous landscape of the Whitsunday Islands. 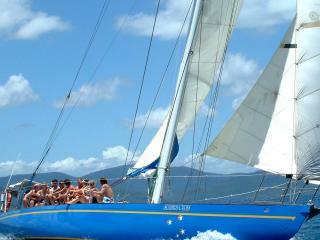 Learn to sail in Australia's premier sailing ground, the Whitsunday Islands with Explore Whitsundays. These courses cover recreational and commercial curriculums. Training is on yachts which meet the National Standards for Commercial Vessels (NSCV). 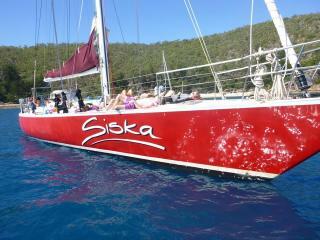 Built in Western Australia, Siska is an 80ft maxi yacht with a single 106ft mast, and has sailed approximately 140,000 nautical miles since arriving in the Whitsundays in late 1992. Rack up some sailing miles of your own and cruise the islands and Great Barrier Reef in comfort. Designed by famous Ben Lexcen and built in Perth by entrepreneur Alan Bond, the 68ft Southern Cross competed in the Americas Cup and now has her 97ft mast in the beautiful Whitsunday Island breezes. Ideal for families, friends and small groups, the Southern Cross is a fantastic way to experience the beauty of the Great Barrier Reef. Showcasing the best the Whitsundays have to offer, Wings 2 features a fun, fast and exciting way to experience sailing and snorkelling, in a friendly and social atmosphere. Meet new friends and enjoy the spectacular vistas of the Whitsunday Islands and Great Barrier Reef on this two day, two night adventure from Whitsundays Sailing Adventures. 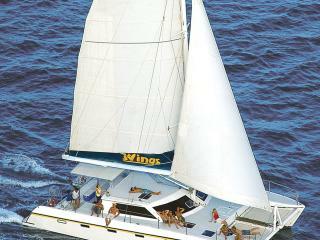 There's nothing like a Whitsundays sailing adventure to get your heart racing and this two day two night cruise aboard Wings 3 is an ideal way to truly appreciate the vast size and beauty of the Great Barrier Reef and Whitsunday Islands. Visit the white silica sands of Whitehaven Beach and discover a vast range of coral varieties.